One of my favorite programs to present are the Storytime Specials. Currently these specials are for children 3 years-1st grade, and the primary attendance is the 3-5 year old range. The program runs 45 minutes, and includes a storytime (replete with songs and fingerplays), a craft or a game, and a treat. Sometimes the themes are broad, such as Apples or Animals, and other times I choose a story or author, such as Where the Wild Things Are or Eric Carle. Over the next few weeks I’m going to post about some of these programs. It should be fun. If nothing else, it gives me a goal for the next month or so, which is something I could sorely use to get through the tail end of winter. I get bored easily. I think that’s why I work well with toddlers and teenagers– we all have a similar hunger for new experiences and pushing boundaries. I was tired of doing the same old preschool storytime. I mean, I loved it, but like I said, I get bored easily. I want to try new things. I want to explore, experiment, and expand my programming horizons. So I changed my preschool storytime into Beginning Reader Storytime. You can read the full story of how my Beginning Reader Storytime began here. This post is going to detail a bit more how I run this particular program. As I often love to brag, I started out in the working world as a preschool teaching assistant, and eventually worked as a lead preschool teacher for a while as well. 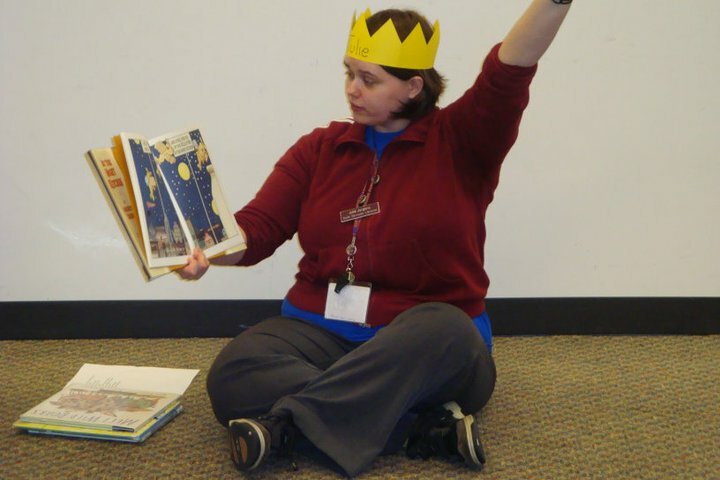 My preschool teaching experience has served me extremely well in my career as a librarian and I put it to good use for my Beginning Reader Storytime (after a couple of sessions I changed the age range to 4 years through 2nd grade, and put three year olds into toddler time. This has been a much better fit for both storytime groups). Nametags are a staple of every storytime, and always having nametags is actually a great literacy activity–learning to recognize your name is the beginning of your experience with letters. Tonight we will be reading the book Snip Snap! I read the message out loud to them–or one of the older kids does it for me–and then I shuffle through their names to choose children to find the letter of the day. For this storytime, I focused on the letter S.
After we circled all of the Ss in the message, I read the book and then we sang the song “Five Little Monkeys Swinging in a Tree.” I’m really brutal with that song; I have the monkeys on the monkey mitt, and they actually get eaten by a fairly realistic looking alligator puppet. The kids love it, though. But if you take this approach, be cognizant of more sensitive children in your group and tailor your bloodthirst accordingly. Then we went to do our table activity. To transition from rug to table, I sing “Willoughby Wallabee Woo”, asking the children to listen for the rhymes in their names. This week I had story paper, an Ellison cut letter S, a glue stick, and markers. I told the children to glue their S down where they liked on the top half of the story paper. Then, they could either create an S creature and tell a story about it, write down some words that began with S, or draw anything they liked and write a story about it. Some parents will balk at this open ended sort of thing, but most will go along with you. Other table activities have included name writing (for 4’s and 5’s who can’t write their name from memory yet, this means copying their name that is written out on sentence strips), alphabet bingo, and lacing with lacing letters. Sometimes the activity is putting together an alphabet floor puzzle, writing on the dry erase board, or playing with magnet letters on the magnetized side of my easel. If you clicked on any of these links, you’ll see that Discount School Supply is a great resource for literacy games and materials. I love this storytime. It’s great to give older kids an opportunity to listen to some great picture books, and it really allows me to show parents that early literacy is NOT Your Baby Can Read or Hooked on Phonics, but rather nurturing a love of literature in children by taking the time to share stories, talk, and write. If anything needs clarifying or if you want more information, please don’t hesitate to ask in the comments, or start a conversation with me on twitter or facebook!